With most of the actual schoolwork completed and a classroom buzzing with students excited about summer vacation, the end of the school year often finds teachers looking for ways to keep students engaged. These crafts, activities, and end of the school year party ideas can help teachers, faculty, class moms and PTA members celebrate with students. A carnival, whether held in the classroom as a theme party, or in the schoolyard for the whole school, is a thrilling, summer-fun preview for students at the end of the school year. Many of the booths and carnival games can be made from simple supplies, such as cardboard and paint. Parents may help run the games and provide additional carnival elements, like face painting and making snow cones. 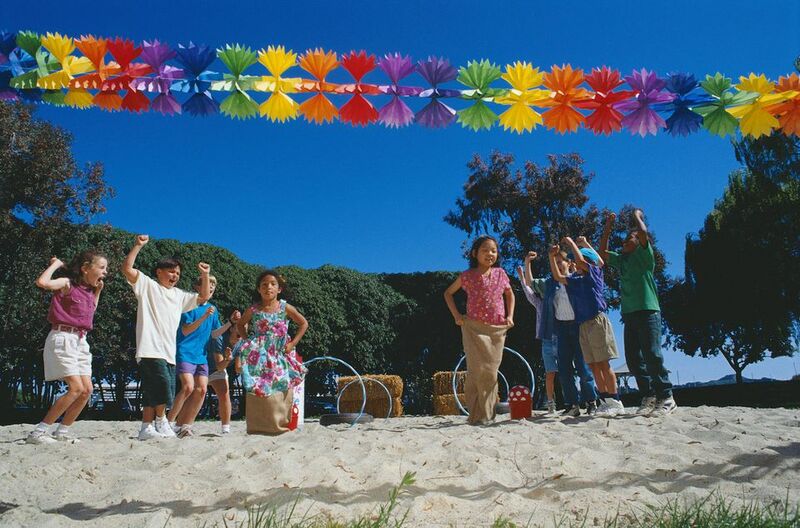 Throw a beach or luau-themed party in celebration of the upcoming summer and the school year that has passed. Ask students to come to school wearing swimwear under their clothing -- don’t forget the beach towels! They can use them to sit on the floor and have a beach party picnic. This indoor beach party may provide some inspiration for beach-themed games, crafts, and food for your classroom's beach-themed celebration. Play a balloon pop game for the last few weeks of school. Have each student write their favorite memory on a piece of paper. Fold the memories and place each one inside a balloon before inflating with helium. Hang ribbons from the balloons and let them float to the ceiling of the classroom. Each day, pull one down by its ribbon, pop it and read the memory. Then spend the day recreating the experience that sparked the memory, or have each student write something special they remember about that particular day. If the kids are looking forward to some summertime camping, why make them wait? A classroom camping day is a fun way to end the school year with your students. Drape sheets or blankets over the desks to create classroom tents under which kids can gather to make shadow puppets with flashlights. A faux campfire is a great place to gather for indoor s'mores, storytelling, and a campfire sing-along. Take your first graders on a field trip -- to the second grade! Arrange with a teacher from the next grade to have your students spend some time in her classroom. While visiting the next grade, kids can participate in an activity and ask questions of the older students about what to expect in the next school year. Just as your class will wonder what to expect in the next grade, so will the students coming in to fill their desks. A cute idea is to have each student write a welcome note for the next group coming in September. Current students can draw a picture and write a description of what they think the future students will like best about the grade, the teacher or the classroom. Hang the drawings up for everyone to admire, and then have the students tape them to the tops of their desks on the last day of school. What do students have planned for their summer vacations? Cut the shape of a bucket and shovel out of cardstock or construction paper. Kids can write their names on the shovels and write a wish list of summer vacation activities on the buckets. They can take these cute “bucket lists” home on the last day of school to use as checklists. Have students decorate and write their favorite school year memory on t-shirt shapes cut out of cardstock. Hang them on a “clothesline” that stretches across the room. This decoration can also be left hanging over the summer to serve as a “welcome gift” for next year’s class.